Brick Street Bakery's new patio is open for business! Bakery customers and the general public now have an outdoor seating option with an excellent view of the Dallas County courthouse and a comfortable place to enjoy delicious Bakery treats. 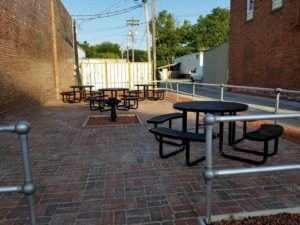 Special thanks to Maple Creek Services for their hard work, which included setting over 2,000 discarded bricks that were pulled from City streets, bought from the City of Adel, and repurposed for the patio.